See also: Wright Brothers National Memorial, Wright Brothers in North Carolina. At 10:35 a.m. on 17 Dec. 1903, the first powered flight of an airplane was made from the base of Kill Devil Hill, a sand dune four miles south of the village of Kitty Hawk on the Outer Banks. The feat was achieved by Wilbur and Orville Wright, brothers in their early thirties from Dayton, Ohio, with Orville at the controls. The Wrights first became interested in flying when reading about the work of Otto Lilienthal, a pioneering German aviator who made about 2,000 successful glider flights before being killed in an air crash in August 1896. Enthusiastic bicycle builders and competitive racers, they took up gliding as a hobby in 1899 but soon considered the possibility of powered, heavier-than-air flight. In mid-1899 Wilbur Wright undertook a systematic study of contemporary knowledge on the subject. Three elements emerged as the fundamentals of flight: wings to lift a machine from the ground, a motor for power, and a way to control a plane in flight. Lilienthal appeared to have solved the first requirement with his cambered wings, and several experimenters had achieved brief liftoff with steam or other types of motors. The unresolved problem was control in the air. Observing the flight of pigeons near Dayton in July 1899, Wilbur theorized that their wingtips enabled them to direct their movements in the air. Tilting a wing upward increased the wind on its underside; simultaneously, tilting the other downward increased the wind on its upperside. The result allowed the bird to turn, rise, and descend at will. The question, then, was whether these movements could be duplicated mechanically. A few days later, Wilbur was fiddling with a cardboard inner tube box in his bicycle shop. Idly pressing the corners of the box's long sides at one end and those of the short sides at the other, he noticed that this distortion of the box mimicked the action of pigeons' wings. He promptly built a model biplane glider to test whether altering its wings in flight would control it. Flying the glider as a kite, he found that strings tied to the wings (cambered like Lilienthal's) could manipulate the plane. This, he realized, was the key to heavier-than-air flight. The Wright brothers then set about building a mancarrying machine. As it neared completion, and seeking sites for experiments, they contacted the National Weather Service in Washington, D.C. The ideal place would have steady winds, hills, soft ground, and few trees or bushes to avoid. From a list of proposed sites, they wrote to weather stations at Kitty Hawk, N.C., and Myrtle Beach, S.C.; only the former replied. Bill Tate, assistant weatherman at Kitty Hawk, had just read a magazine article on flight and was eager to host the Wrights. His letter stressed that there were sites well suited to their purposes nearby and that he could provide temporary accommodations at his home. Wilbur Wright arrived unannounced at Tate's door on 12 Sept. 1899. He had brought with him the crated glider, as Orville remained briefly in Dayton to close their shop. After Orville arrived, the brothers set up camp at Kill Devil Hill, the tallest dune on the Outer Banks. Over the next 39 months, the Wrights returned to Kill Devil Hill for several months each year to test a series of gliders, each of which had been altered based on previous lessons learned. During this time, the brothers broke virtually all existing glider records. A flight by Wilbur in October 1902 covered 622 feet in 21 seconds, both the distance and time setting American records. In achieving these results, the Wrights were assisted by a host of Outer Bankers, who helped prepare takeoff sites, launch gliders, build hangars and living quarters, bring in materials for experiments, and send and receive messages, among other things. Bill Tate's brother Dan was the Wrights' only paid employee. In early December 1903 the Wright brothers attached to their latest glider a 12-horsepower motor, built under their direction at Dayton. They targeted 14 December for their first attempt at powered flight. They hoped to fly to Kitty Hawk that day, but Wilbur made only a 60-foot, gravity-aided downhill hop, splitting an elevator support. Nevertheless, the publicity-shy Wrights wired home: "Success assured keep quiet." The second attempt occurred on 17 December. At 10:00 a.m. a red flag was hoisted as usual to summon available men from the nearby Lifesaving Station, most of whom were far up the beach watching efforts to refloat a beached submarine. Three men-John T. Daniels, Adam D. Ethridge, and William S. Dough-responded. With them came W. C. Brinkley, of Manteo, who was trying to salvage lumber, and John T. Moore, a 17-year-old out looking for crabs. The Wrights had assembled a monorail of two-by-fours on level sand at the base of the dune, the plane being equipped with a grooved wheel at each end. They set up a tripod camera and asked Daniels to photograph the plane as it left the track, although he had never taken a picture before and never did again. Orville won the coin toss to fly the machine, and men were assigned to balance it by holding its left wing and tail while Wilbur held the right wing. The Wrights each turned a propeller to start the motor, and Orville lay on his stomach between the wings. At 10:35 a.m. the plane moved along its track, lifting as it reached the end into a 27-mile-per-hour wind. Bucking and lurching with an excited Orville struggling to keep control, the plane in the next 12 seconds darted forward for about 120 feet-a ludicrously short flight, but an astonishing historical event. The witnesses, several of whom had assisted glider takeoffs, saw a flight that differed little from the others except that it was shorter and not as well-controlled as most. John Daniels later candidly told reporters, "I didn't think it amounted to much." But three more flights that morning, the final one lasting for 59 seconds and covering 852 feet, demonstrated that the world was at the threshold of a technological revolution. The Wrights left the next day for Dayton and renown of mythical proportions. In 2003 a variety of celebrations marking the 100th anniversary of their achievement took place throughout North Carolina. Fred E. C. Culik and Spencer Dunmore, On Great White Wings: The Wright Brothers and the Race for Flight (2001). Thomas C. Parramore, First to Fly: North Carolina and the Beginnings of Aviation (2002). Orville Wright to Carl Dienstbach. January 8, 1904. Shapell Manuscript Foundation. http://www.shapell.org/manuscript.aspx?169819 (accessed May 29, 2012). 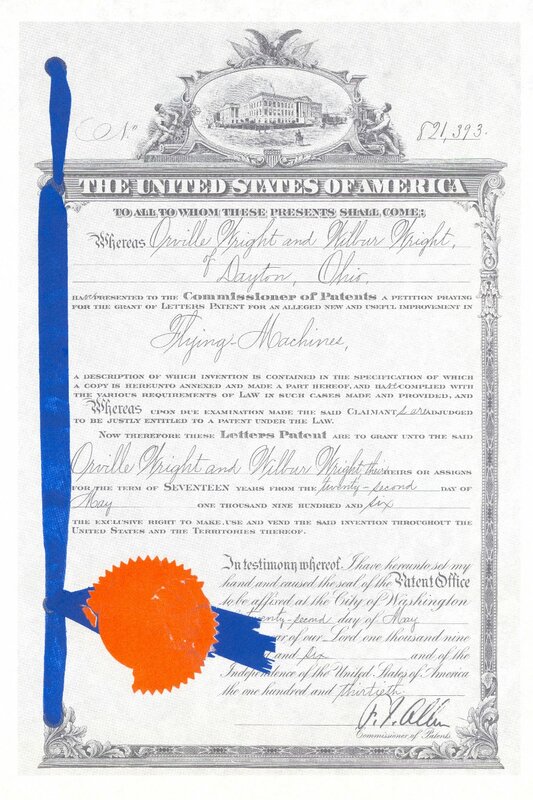 Wright Brothers' 1906 Patent (5/22/1906) http://archive.org/download/GPN-2003-00067/GPN-2003-00067.jpg (accessed May 29, 2012). NASA LaRC Office of Education. "The Wright Brothers" NASA Connect. January 10, 2002. http://archive.org/details/NasaConnect-Twm-TheWrightBrothers (accessed May 29, 2012). Renstrom, Arthur George. Wilbur and Orville Wright: A Reissue of a Chronology Commemorating the Hundredth Anniversary of the Birth of Orville Wright, August 19, 1871. Washington, D.C.: NASA, 2003. http://archive.org/stream/nasa_techdoc_20040000754/20040000754#page/n1/mode/2up. Wright, Orville, and Wright, Wilbur. The Early History of the Airplane. Dayton, Ohio: Dayton-Wright Airplane Co. 1922. http://archive.org/stream/earlyhistoryofai00wrigrich#page/n5/mode/2up. Jakab, Peter L., curator, "The Wright Brothers: The Invention of the Aerial Age." Smithsonian National Air and Space Museum. http://airandspace.si.edu/explore-and-learn/topics/wright-brothers.cfm (accessed May 29, 2012). Wilbur Wright Birthplace and Museum. http://www.wwbirthplace.com/ (accessed May 29, 2012). Kirk, Stephen. First in Flight: The Wright Brothers in North Carolina. Winston-Salem, N.C.: John F. Blair Publishers, 1995. The first powered airplane flight at Kitty Hawk, 17 Dec. 1903. Courtesy of North Carolina Office of Archives and History, Raleigh. 1 January 2006 | Parramore, Thomas C.
Thanks for visiting NCpedia and sharing this with us. And good luck with your report!